Materials Used : Frame : Powder Coated Mild Steel with Nylon Connectors. Fabric -100% Water Proof 900D Polyester with P.U.Coating. Dimensions : 285 x 285 x 200 Cm. Weight - 36 Kg. Can be folded and unfolded in 2 minutes. Hooks provided on 4 corners of fabric to hold rope to tie to fix position of gazebo during high wind flow. Portability because of small volume in folded condition THE PRODUCT IS SUPPORTED BY AFTER SALES SERVICE FOR SUPPLY OF COMPONENTS Also available in light duty model with light weight economical frame with low cost. 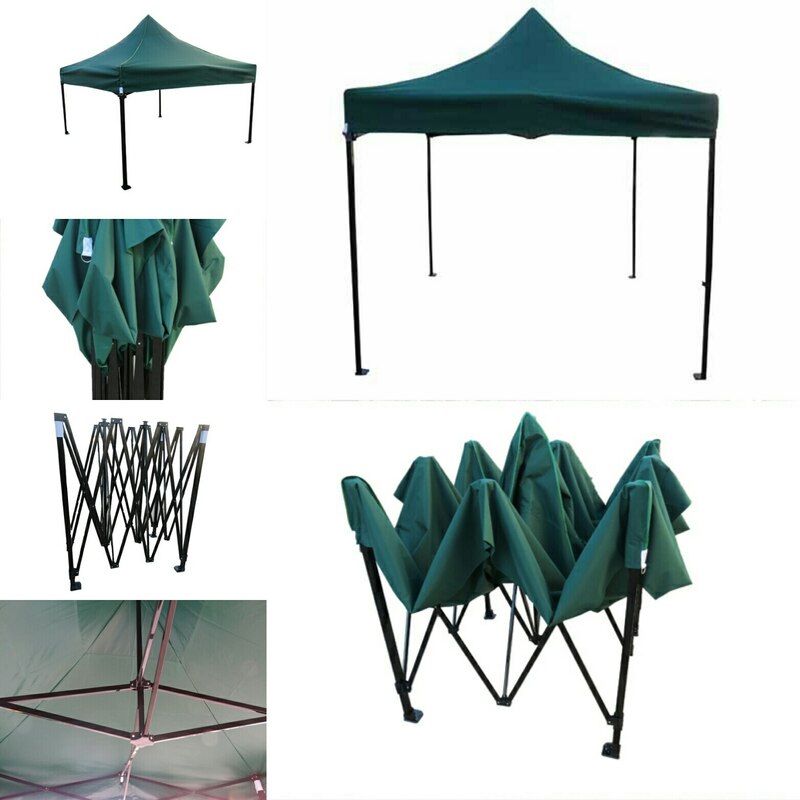 PLEASE REFER "AMAZE" CATALOG Quick and easy to fold & unfold in 2 minutes ,clear minimum height within gazebo is 6.5' at center ,clear vertical room inside gazebo increases up to 8' on 4 directions from center to end of its length and width. ,telescopic legs comes down to 4.5' height in folded condition. Height is adjustable in 3 stages. Nails can be fastened in a hole provided in a welded plate on all 4 legs to hold gazebo securely in position. Can be tied from all 4 directions using ropes to be fastened in hooks on fabric velcro fasteners and hooks on 4 corners provided to hold fabric with frame. Easily washable & 100% water proof. Easy to install. Can stay in position even by its own inertia weight. MATERIALS USED : Frame : made of square tubular powder coated mild steel section. Roof : made of 900D P U coated polyester fabric. APPLICATIONS: Best suitable for car parking ,small event celebration ,product display and camping ,ice cream parlour ,food parlour and food plaza ,garden restaurant ,temporary shed for work shops, AVAILABLE SIZES : 3 m x 3 m (10 x 10 feet) ,4.5 m x 3 m (15 x 10 feet), 4 x 4 m (13 x 13 feets) SPECIAL INSTRUCTIONS : Return of this product is not accepted by the seller unless it is found defective by the buyer while taking delivery and/or if the product is not as per its description on amazon website. Such discrepancy is to be reported along with proof of the same within 24 Hrs. after delivery of the product .